The Squirrel Buster bird feeder is indeed doing its job. After our bear incident last weekend, I found all of the pieces strewn about the yard and managed to reassemble it, and, remarkably, it’s working again. Instead of rehanging it in a nearby tree, I hung it on the front porch hook to take the place of the shattered ceramic feeder the bear destroyed. The squirrels have figured out how to leap from the front porch railing to the feeder, but so far their efforts have gone unrewarded. Due to their heavier weight, the metal sleeve slides down and the seed openings in the plastic feeder are no longer accessible. I’ve certainly received some angry squirrel glares and chatters today as I photographed their many attempts. But, seriously guys, there are plenty of other places to find a nice meal now that spring is here. Please, give my wallet a break and let the birds have some feed for a change. After all, it is called BIRD seed for a reason! Perfect photo and goes with your title so well! Thanks so much, Cee! It’s back again and giving me the evil eye while I’m sitting here at my desk. They are persistent little creatures! What a great photo of the little scamp! 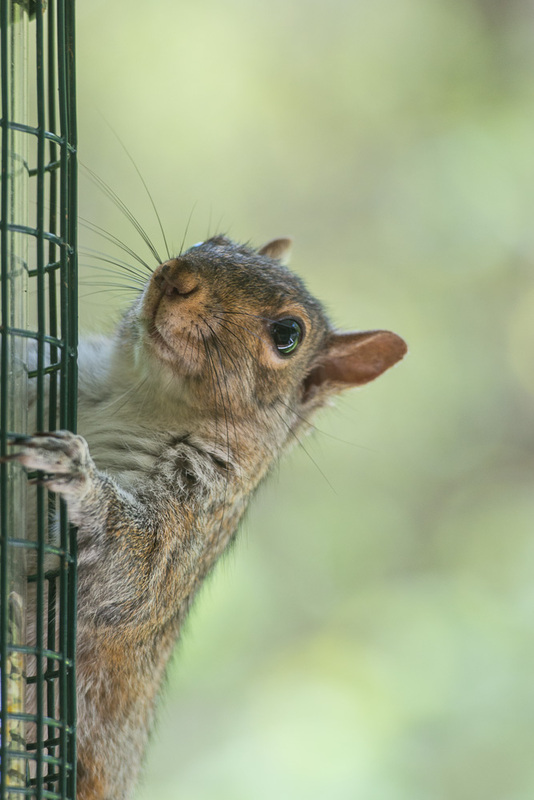 We have a squirrel-proof feeder (a different type). They learned to hang from the roof of the feeder and eat upside down. We have had the most success with putting vaseline on the shepherd’s hook where the feeder is hung. We sprinkle the vaseline with ground red pepper. The squirrels are not harmed by the red pepper, but they do not attempt to climb after getting a taste of the pepper! And birds are not affected by pepper, if they accidentally pick up a little from the ground. That’s funny! My dad just told me about using red pepper to keep the squirrels away. I’ve heard it works for deer, but I hadn’t thought about the squirrels. I have some on hand and will give it a try tomorrow (with my camera prepared!). When I had it on the tree, they would hang down and manage to get some seed. This placement seems to be better. This is great Tricia! I’m still smiling as I write this. Love the wallet reference…and they sure are persistent little buggers aren’t they? Thanks, David! I’ve spent a small fortune feeding them over the winter, which I didn’t mind as much since food was scarce. But now the free meals are gone! Tricia, first visit to your blog…nice to meet you. This photo is precious!! Thank you so much for introducing yourself! I look forward to a visit to your blog in the near future! HAHA ! this is awesome ! Love the look he’s giving you. I have less birds in my yard the past week or so, so I’m putting out less food. Besides it’s time my fat squirrels go on a diet. Yesterday, one of them came up to the window where I sit with my back to. Climbed onto the trim and began scratching right behind my head ! Yes! He wanted food and wanted it now! That’s so funny! Mine are still a bit wary of the dog so they don’t get too close to the windows, but they are also plump! No more feeders out because of the bear, though. Birds and squirrels will have to fend for a while.